Dubai: The aviation industry wants to see an improvement in the sharing of intelligence and security information by countries when it comes to possible threats against passenger planes. Aviation officials from the airline, air traffic control and airports industries met in Montreal, Canada, on Tuesday at a gathering hosted by the United Nation’s International Civil Aviation Organisation (ICAO). The meeting, attended by the International Air Transport Association’s, Airports Council International (ACI) and the Civil Air Navigation Services Organisation (CANSO) was called after Malaysia Airlines flight MH17 was shot down over eastern Ukraine by a surface-to-air missile earlier this month. Emirates’ European rival Lufthansa and other airlines had called for an industry summit to address safety issues arising from the downing of the Malaysian airliner. At Tuesday’s meeting, the organisations said they would review processes for flying over conflict zones. Emirates, the Middle East’s largest airline, has already announced it will soon avoid Iraqi airspace, with the shooting down of the Malaysian airliner stoking fears of a similar incident occurring over areas of Iraq controlled by insurgents. “This is a highly complex and politically sensitive area of international coordination, involving not only civil aviation regulations and procedures but also State national security and intelligence gathering activities,” the joint statement said. ICAO will now establish a task force to work out how exactly the highly sensitive information can be collected and shared. But it is not clear how ICAO will be able to improve the way information is shared between countries and the aviation industry. 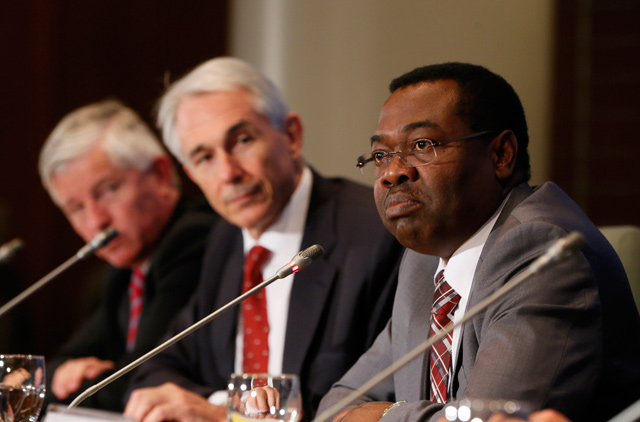 “ICAO … does not have any authority to force states to share information. It can only try to coordinate and unify the approach to better, more consistent and transparent sharing of information,” John Strickland, Director at JLS Consulting, told Gulf News in an email on Wednesday. Just last week, industry agencies highlighted the discrepancies in intelligence on safety threats to passenger planes. Israeli authorities said Tel Aviv’s Ben Gurion Airport was safe even as the United States Federal Aviation Administration told its airlines they could not fly to the airport and the European Aviation Agency strongly advised its airlines not to fly there due to rocket attacks into Israel from Gaza.